One of the body parts that every aspiring weight trainer wants to build right away is the chest! 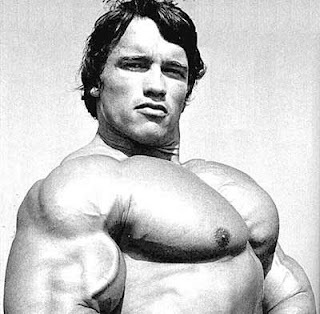 Every kid wants to build that giant Arnold Schwarzenegger upper body, and the pecs lead the way (literally). For most beginners, the pecs grow pretty fast -- at the beginning. But then things take a turn for the worse. In some cases, the chest development stops altogether. One of the reasons is that the supporting muscles, like the delts and triceps, bear most of the brunt of the heavy bench presses that most weight trainers perform. If you do not do your chest training right, you will never feel any stress on the pecs. This article will help you build maximum tension in the pectorals by using some simple techniques. First off, get used to supersets! These aren't your normal supersets, though. Nope. These are "pre-exhaust" sets designed to put serious stress on the chest by first performing an isolation movement followed immediately by a compound exercise. Here's how it works. Perform a set of flat-bench flyes with a weight that allows you to do 6-8 reps. Immediately jump into a set of heavy flat-bench presses or inclines. Another way to place maximum stress on the pecs is to take some weight off the bar. Yeah, you read that right. Often, when trying to lift maximal or near-maximal weights, we forget about feeling the chest work and instead focus on moving the weight. I sincerely believe that you must push heavy weights to build mass. However, much more importantly is lifting a weight that you can feel. A very impressive bodybuilder with a massive chest back in his day was Serge Nubret. He was known for his super power in the bench press, having the ability to press over 500 pounds. However, he rarely trained in the bench with more than 300-350 pounds. He made this "light weight" feel much heavier by concentrating on the feeling of the movement rather than the successful completion of a max rep. So take some weight off the bar and start feeling your pecs work. Your chest will grow again if you do. When doing really heavy bench presses, we tend to tightly grip the barbell. It's a natural response. But try to loosen your grip a bit; you'll find that by doing so, you'll get more pec involvement and considerably less tricep and shoulder involvement. This tip goes hand-in-hand with using a lighter weight to feel the pecs working. If you want to learn 7 more tips and techniques for building a bigger chest, check out How to Feel Your Pecs Actually WORK When You Do Chest Training.